Dehai News -- Ethiopia-Insight.com: Can Team Lemma bridge Ethiopia’s political chasm? Ethiopia-Insight.com: Can Team Lemma bridge Ethiopia’s political chasm? Can Team Lemma bridge Ethiopia’s political chasm? Abiy and Lemma’s neo-unionism is an attempt to find Ethiopia’s third way. But for how long can they keep patriotic unionists and ethno-nationalists happy? In February, an Ethiopian Prime Minister, for the first time, resigned, throwing into confusion a coalition that had ruled the country with an iron fist for more than two decades. This signaled the beginning of the end of authoritarianism and a political system dominated by the TPLF, the pioneers of ethno-nationalism. Now, Ethiopian politics is trying to strike a balance in the raging struggle between ethno-nationalists and patriotic unionists. At the center of this ideological war is the issue of self-determination, a process that can involve conflict, as seen in the long struggles by Eritrean and Tigrayan insurgents. The outcome for Eritreans, statehood, contravened the principles of national sovereignty and territorial integrity that are held dear by patriotic unionists. For ethno-nationalists, Ethiopia’s political woes are embedded in its historical development and successive regimes’ failure to address burning ethnic identity issues. For them, ethno-nationalism improves fragile security, builds trust, and protects rights. Unionists fear the implications of a constitution that legally recognizes the controversial principle of self-determination including secession. Ethiopia’s ongoing reform can be seen as an extension of the ideological debate over ethno-nationalism, with constituent parts of a ruling coalition holding increasingly divergent views. The emergence of quasi-unionists, whose agenda is based on love, unity and a multi-layered Ethiopian identity, a platform that is closer to that of the patriotic unionists, overturns the table on the ethno-nationalists, and complicates the current political equation. The division within the ruling party, however, offer opportunities for strategic alliances for both unionists and ethno-nationalists. While the EPRDF old guard, especially from the TPLF, may be a suitable match for a partnership with ethno-nationalists such as the liberations fronts from Oromia, Somali, Sidama and Gambella, moderates and reformists in the ruling party, on the other hand, could be an ideal match for patriotic unionists, as they share common values and ideals. Neo-unionists, known as ‘Team Lemma’, comprise charismatic and strategic leaders, who champion reforms and challenged the foundation of the EPRDF. They reassure the unionists, providing them with emotional and psychological stability as well as confidence and morale, with statements like ‘Ethiopiawinet is an addiction’. For some viewing from the sidelines, it is hoped that Prime Minister Abiy Ahmed can break the ideological impasse at the macro level that manifests itself in ethnic conflicts at the micro level. However, the ideological battle continues to shift and throw up new challenges. For example, many Amhara are adopting ethno-nationalism, such as that espoused by the National Movement of Amhara (NaMa), as a response to the political and economic marginalization of the Amhara people, but many see that as threatening for minority rights. Such a rise in new ethno-nationalist sentiments stirs anxiety among the patriotic unionists, who are mindful of recent nearby cases of state fragmentation and failure, such as in Somalia, Yemen, and South Sudan, as well as the previous disintegration of federations in the Soviet Union and Yugoslavia. The fragility and fractiousness of the federal structure has left patriotic unionists fearful that the political union could unravel completely; this can be seen buried in Berhanu Nega’s recent lament that Ethiopia has lost its moral compass. In August and September, Addis Ababa was alive with the jubilant celebrations of Ginbot 7 and the Oromo Liberation Front (OLF) returning home following the implementation of an amnesty by the neo-unionists. It is not clear though if this reforming agenda and the emergence of neo-unionists will see a significant shift in an ideological debate that has G7 and OLF on opposing sides. Ethnic nationalism and related conflicts are indeed on the rise and the ideological divide has grown larger. This may well be exacerbated by deepening economic troubles and shrinking government budgets. The neo-unionists’ ad hoc transition has occurred after angry youths took to the streets in protest. They are not tied to an ideology, but were motivated by a demand for an end to authoritarian rule and the realization of their aspirations and government promises. While the neo-unionists can deliver accelerated democratization, what is not clear is the future of the current ethno-federal arrangement under their leadership. While some of their patriotic unionist supporters suggest scrapping it completely, that is a minority view in a political environment dominated by aspirations for self-rule. Oromia was the center stage of the street protest that allowed Team Lemma to take charge. A key neo-unionist, Oromia President Lemma Mergersa, emerged as the people’s man after he defended streets protesters slain by federal security forces. He also used a language that had disappeared from the domestic political vocabulary of Ethiopia. “Ethiopianism”, surged again for the first time in an ethno-nationalism-dominated environment, shaking the foundation of the EPRDF establishment. But no sooner had the shift been made, then the return of the OLF, a strong ethno-nationalist movement, that for decades fought for the Oromo right to self-determination, tested the people’s hero. Ever since there have been tensions and sporadic conflicts in Wollega, home of OLF leader Dawud Ibsa. Another important player in Team Lemma is, of course, Abiy Ahmed, who invested much of his life in an ethno-nationalist system that he now seems to have largely abandoned. The neo-unionists sudden shift could be seen as a survival tactics to rally the public amid rising ethno-nationalism sentiments, or perhaps they only previously employed ethno-nationalist rhetoric to achieve their political ambitions, and were never attached to it. Preparations are now underway to hold free and fair elections at the end of the decade. Birtukan Mideksa, a former judge and opposition politician, will head the electoral board, which was partly responsible for the ruling coalition’s landslide victories. The new chairperson’s position is delicate, as she is to referee between her former political opponents and opposition colleagues. She will not be only one with divided loyalties. The neo-unionists look set to count on the popularity of Team Lemma rather than the rebranded Oromo Democratic Party, which is largely discredited in Oromia. It is a strategic gamble that may cost the neo-unionists in the election. If the OLF assumes power in Oromia, and NaMA continues to rise in Amhara, that would mark the next major shift in a newly dynamic political scene. 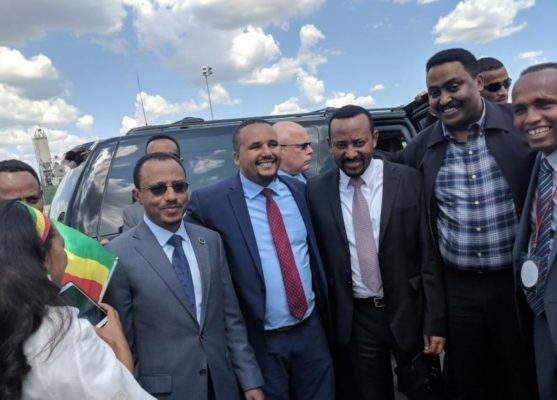 Main photo: Abiy Ahmed and Lemma Megersa with activist Jawar Mohammed in the U.S.